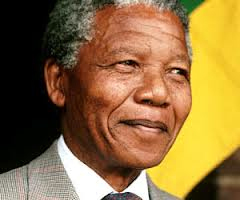 Nelson Mandela, the “father” of the country I live in, has died. He died because he was a mere man. An extraordinary man, but a mere man. As I watched the footage covering his life and death, I was reminded of the passage above. Have you noticed that the error of deifying a mortal was committed by the people and not by Herod? The passage never suggests that Herod thought of himself as a god. It was the people who committed the sin of idolatry. Herod’s sin was not one of commission, but of omission. He failed to correct the people’s error. As Montaigne famously quipped: We do not know how to make a maggot, but we create gods by the dozens. It is noteworthy that the passage from Acts never disputes Herod’s greatness. It was the origin of that greatness that was at stake. Similarly, Paul and Barnabas’ abilities were not downplayed. Rather, the passage directs the attention away from them and to God as the source of life and goodness. This is the lesson, and we shall do well to take note of it in the aftermath of Nelson Mandela’s passing. Was he a “great man”, according to human standards? Certainly. In fact, he was one of the greatest, and so shall he be remembered. Did his greatness originate in himself? Certainly not, and we dare not remember him as though it did. Perhaps you find it disturbing to imagine that Nelson Mandela was a mere mortal that was greatly gifted by God to do what he had done. Perhaps his accomplishments were slightly too “unspiritual” for you to draw such a conclusion. I mean, he did not even confess Jesus Christ as Lord. Why would God allow a man to be filled with power, wisdom and humility without bringing such a man to his knees and publicly declare Christ as Lord? Cyrus II of Persia, like Herod, was known as “the great”. At the time of his reign he created the largest empire the world had ever seen, and his other accomplishments were numerous and legendary. His Biblical significance had to do with his conquest of Babylon in 539 BC. Put simply, Cyrus was raised up by God and made “great” to be an instrument for delivering God’s people from their captivity in Babylon. All his other feats were circumstantial to this one great purpose of his life. Was it necessary for him to be a converted Jew in order to obey this calling? Not at all. God had a purpose with Cyrus and that purpose was fulfilled in and through Cyrus’ life. Cyrus was great because God made him great, and God made him great for God, not for Cyrus. None of this should sound strange. In Paul’s letter to the Christians in Rome (note that this was Rome) he wrote: “Let everyone be subject to the governing authorities, for there is no authority except that which God has established. The authorities that exist have been established by God. Consequently, whoever rebels against the authority is rebelling against what God has instituted, and those who do so will bring judgment on themselves” (Romans 13:1-4). He goes on to call the authorities “God’s servants” and “agents”. If you are looking for a historic example of a deeply spiritual human government, please skip Rome. If ever a government embodied the spirit of the Antichrist, Rome was it. Yet they were there because God established them, and he did so for his own purposes. So why on earth would God raise up a “great” man at the southern tip of Africa to guide a country through democratic elections and prohibit a bloody civil war? To tell you the honest truth, I don’t think anyone has a clue. Maybe one day we will know, but I do not believe that we do at the moment. My best guess is that it is either because of past prayers or future plans that God may have for this country. Or perhaps a bit of both. But I cannot say for certain, and I don’t believe anybody else can. You may suggest that it was to deliver the oppressed masses, but I don’t think that was the only reason. “My kingdom is not of this world. If it were, my servants would fight to prevent my arrest by the Jewish leaders. But now my kingdom is from another place”, Jesus said to Pilate. God is not in the business of freedom fighting. 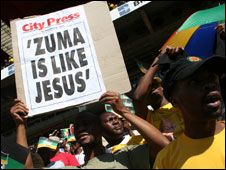 He is not on the side of the ANC, or, for that matter, on the side of any government. He has established them for his own purposes, but that says no more about his affections for them than it does about his feelings for Rome during the time of their governance. Of course God is on the side of the oppressed. But his delivery of them is much greater and more inclusive than what we have seen in South Africa. South Africa is not quite the Kingdom of God, and it will never be. Furthermore, many oppressed worldwide will remain oppressed until the coming of Christ. That does not mean that we should be apathetic about their lot, but simply that we should not confuse our humanitarian efforts with the sum total of God’s agenda. Nelson Mandela was great because God made him great, and he did so for his own purposes. If anyone should get the glory, praise and honour for Mandela’s greatness, then it is God. Let us not fall into the same error as the crowd in Herod’s day. Let us give praise where praise is due. And let us not fall into Herod’s error and be quiet about the crowd’s error.